I cannot believe that Holy Week is already here. I look forward to this week mainly because of the special memories it holds for me. When I was at Helias Catholic High School in Jefferson City, MO, I would take a group of students on mission to Mexico during Holy Week where we would team up with the students and teachers of Collegio Regis LaSalle. consecrated hosts into the small villages in the Sonoran Desert so the locals could receive the Eucharist every day of Holy Week. 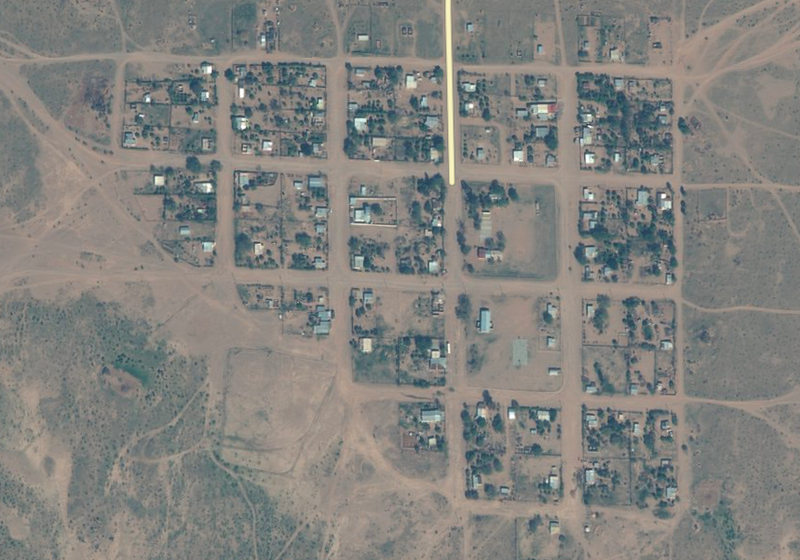 Each of the small villages has a two-room school house and a church. But, there are so many of these villages, usually 5 to 10 kilometers apart, that there aren't enough priest to go into the villages to provide the Eucharist during Holy Week. So, the missionaries would spend Holy Week in these villages in order to provide the locals with communion service where everyone had an opportunity to receive the body of Christ. It is my understanding that the Bishops of Mexico came up with the idea of creating missions where the missionaries are made up mainly of high school students from the Catholic Schools in Mexico. They train all year so they will be prepared for living in the villages and leading all Holy Week events and activities. 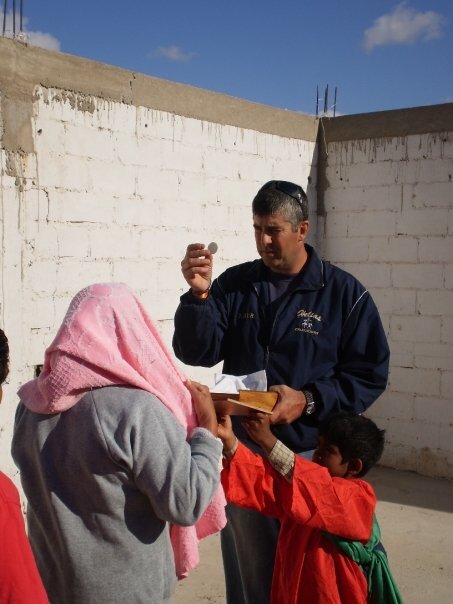 Not only do the missionaries lead the Holy Week events and activities, they also serve the people of the villages by doing home repairs, organizing clean up projects, and even working to build churches. 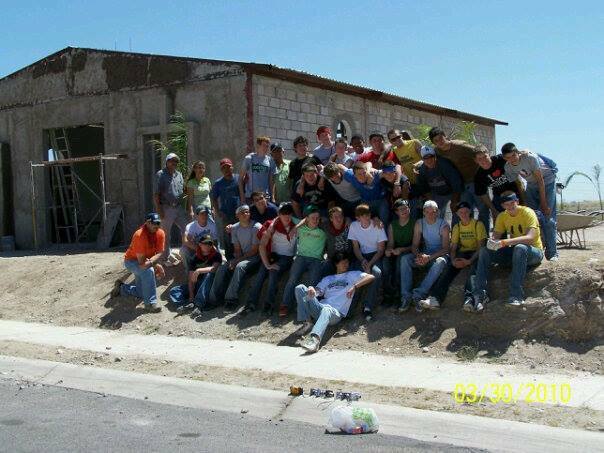 On one mission trip to Cerro Blanco, our group of 17 missionaries (15 students and 2 chaperons) teamed up with some of the locals and installed a concrete floor in a church. The church had a dirt floor and no roof. Since then, another team has installed a roof on the church as well. I just got on to Apple Maps and was able to find Cerro Blanco on the satellite map. I found the church and it does have a roof on it. On another mission to the outskirts of Hermosillo, we helped to refinish a church in order to have it ready for Easter Mass. We not only completed the work, we were also able to attend Mass there that Easter. While in the villages, it is a tradition for the locals to invite the missionaries to their homes for lunch. This is when I learned that those who have the least give the most. It is amazing how that happens, and I have seen the same thing happen over and over. It is not always the case of the least giving the most because there are plenty of people who are well to do who reach deep to help others. be invited to lunch with folks that had almost nothing. As missionaries, we would go out in groups of two or three as to not overburden our hosts. They wanted to share their almost nothing with us as a thanks for our work as missionaries. I believe their almost nothing actually contributed to more kindness, more humility, more caring, and bigger hearts. The most memorable meal was when a blind lady invited three of us to eat at her two roomed cinder block hut with dirt floors. She served homemade corn tortilla cooked on a wood-burning stove that was actually an oil barrel with a hole on the side to fill with wood. We watched as she hand-rolled tortilla and placed them on the stove top to cook. Since she was blind, she cooked by touch and feel without the use of any cooking utensils. Those were the best tortillas I've ever eaten, and being in her humble home made us appreciate her gift of food even more. uniform including Jesus carrying a cross. Each station was set up throughout the village as we would precess to the highest point in the village, which was usually a small mound, to the final station for the crucifixion. Everyone in the village took part in the stations. The American students learned their lines in Spanish in order to participate. It was powerful seeing your students on the cross next to Jesus. One year, I was a Roman guard. I did not like playing that role. 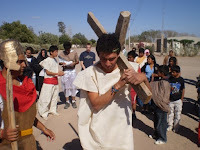 Even though it was a reenactment, I could not force myself to turn around to watch Jesus carrying the cross. Also on Good Friday, weird things would take place. One year, the full moon of Easter was extra bright and appeared to have a ring around it making it look like Saturn. The missionaries in the other villages saw it as well. The following year, we had rain and strong winds for most of the night on Good Friday. I know it rained because I slept outside in the Sonoran Desert during these missions. The next morning, I asked one of the locals about the rain. His reply was that he had never seen rain in that village except in December. On Easter Sunday, before the mission came to an end, all the missionaries and many of the locals from all the villages would attend Mass in La Y Griega, which is a part of the city of Caborca. Easter Mass was a celebration like I've never seen in a Catholic Church. The students celebrated and danced as they received the Eucharist. The priest was so overcome with joy that he just sat and watched the students sing hymns and dance, which took place after nearly 250 students had a group hug with the priest. I'm not too proud to say that I was overcome with tears and emotions watching this celebration of love and resurrection. It was always a great ending to fantastic missions. 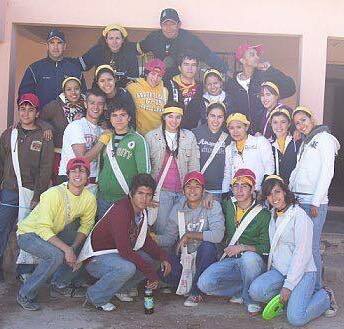 I long to return to missions with my great Mexican friends from Colegio Regis. 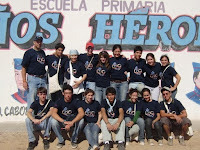 I hope to one day take students back to Hermosillo for missions. 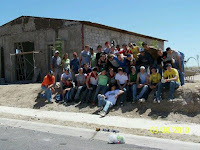 My life and the lives of all the missionaries changed for the better on every mission trip we attended. 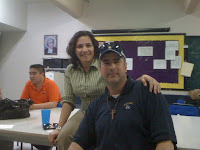 On my final two mission trips in Mexico, I was partnered with Ana Lopez. 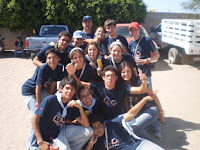 We formed a great team and were the lead chaperons in Hermosillo and Cerro Blanco. She was like my little sister. 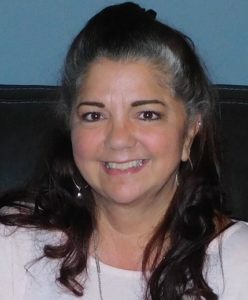 Several years ago, Ana lost her battle to cancer. When Holy Week arrives, I think of Ana and the great times we had leading the high school missionaries in the deserts of Mexico. Ana Lopez...Pray for us! Since today is the first day of Holy Week, the students of the Catholic Schools throughout Mexico are now in the villages serving as God's ambassadors sharing His love with those who normally don't have the opportunity of receiving the Eucharist. Please pray for these missionaries and the success of their mission. They are spending a life-changing week doing what we all should be doing every day; serving God by living Matthew 25:40. St. Ann was well represented at the 55th Annual State Bowling Tournament in Smyrna this weekend with both current students and alumni taking to the lanes. 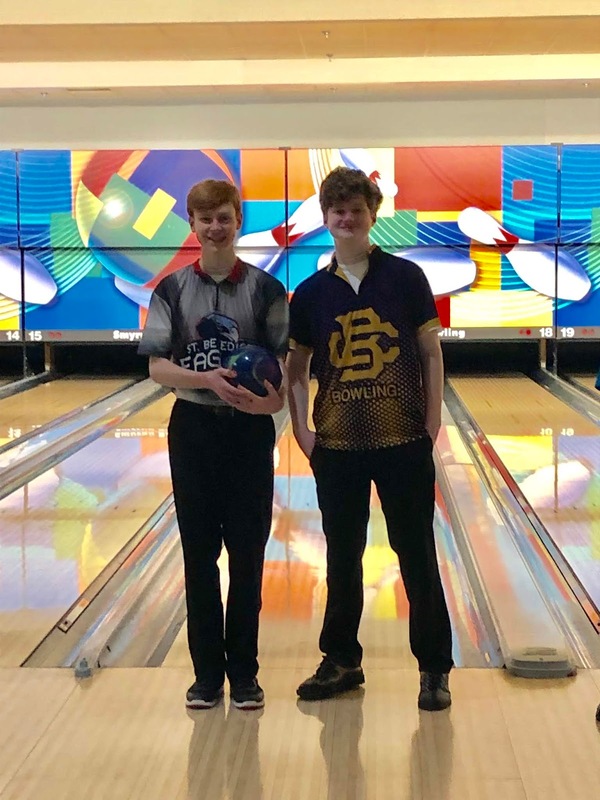 Adam Fillion ('20), and Ethan Nichols ('22), bowled in all events including singles, doubles and team. The team that Ethan was on came in 7th in the State out of 37 teams in their division. Alumni Nick Agnew ('14), Seth Nichols ('15), Jacob Christian ('16), and Tony Craig ('16) also bowled in singles, doubles and team. To participate, bowlers must be in a junior sanctioned bowling league. 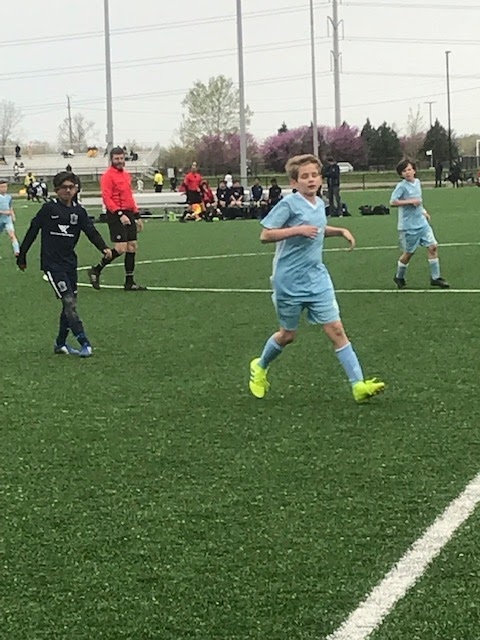 This weekend, Taylor Damore played in the St. Louis Scott Gallagher Soccer Tournament with his Arlington Soccer Association '07 team! They had snow in that area this weekend so I know it was cold. One last thing, I have to share a picture of our students using the new headphones in the computer lab thanks to Jim and Susan Garts! Please keep St. Ann in your prayers as we make our way through Holy Week. With Easter Break coming up, the next blog will come out in two weeks unless some fantastic things take place between now and then. There is so much to write about for this week's blog that I'm not really sure where to start. But, it is 8:45 pm right now and I'm just getting started. Don't want this to be a late night so I better type fast because wherever I am in the blog at 10:30 pm, that's where I'm going to stop. The last line of our prayer every morning at St. Ann is "Perform small acts of kindness throughout the day." 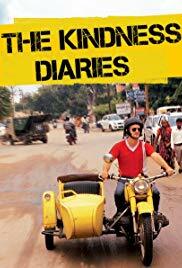 Have you ever watched the Kindness Diaries on Netflix? In the Kindness Diaries, a gentleman by the name of Leon travels the world. He does so with no money. He does not accept money from anyone. He only accepts food and a bed for himself, and gasoline for his motorcycle named Kindness One. He relies 100% on the kindness of others to make it around the world. If he receives no food, he doesn't eat. If he receives no invitation to sleep, he has to brave the elements. Not sure where I'm going with this except to say that this is what I am trying my best to teach our students; KINDNESS! It is important to show kindness to everyone we meet be they strangers or the classmate sitting two feet away. We must show kindness; this means in the way we talk, act, react, including our body language and facial expressions. Part of being kind is to be inclusive and not exclusive. 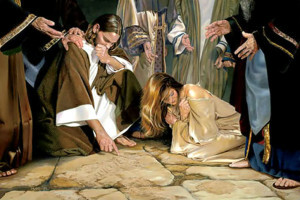 Then Jesus straightened up and said to her, "Woman, where are they? Has no one condemned you?" She replied, "No one, sir." Then Jesus said, "Neither do I condemn you. Go, and from now on do not sin any more." Jesus was not concerned with a person's past. He was and still is concerned with what lies ahead for each and every one of us. If we spend more time and give more effort to being kind, we wouldn't have to waste so much time and effort trying to correct situations that come about because of a lack of kindness. "Neither do I condemn you." I am using the Kindness Diaries with my 7th grade World Geography class to help them understand the importance of kindness, and how kindness can improve the lives of the giver and receiver. My 7th graders had a 100 point test last Thursday. It was a pretty tough test. But to help the students, I always give at least one extra credit question. Their extra credit question was: "What act of KINDNESS have you performed today?" Half of my students answered the question. I can be an optimist or pessimist about their response. I can be happy that half of my students performed an act of kindness that day. Or, I can be sad that I'm failing in teaching half of my students to be kind. I think I'll take the optimist road because I know bad things spread fast and good things take time to cultivate. By the end of the school year, I'm hoping my 7th graders all create their own Kindness Diaries. On another front, you know I'm very big into communication and transparency. I don't like rumors so I don't give people an opportunity to create rumors due to the lack of information. Please understand that I am limited in certain situations as to how much information I share. With that understanding, we have made a change in the Art program at St. Ann. Kathy Herbert will be the art teacher for this week until we can find a permanent replacement. I have several people interested in teaching art at St. Ann, and the interviews will begin this week. That's as much as I can say about any developments in our Art program at this time. Marcella Han is a first grader at St. Ann. She is part of a competitive dance team. She and her teammates competed in their last competition of the year this weekend at Starpower at the Cannon Center. They earned 4.75 stars out of possible 5 points, a first place in their category, and a third place overall. Marcella has danced for 4-years, and this is her second competition this year. Back in December, she also auditioned and was casted in Moscow's Great Russian Ballet Nutcracker. Congratulations Marcella. With all the dancers at our school, maybe we should start a dance team. I am working to hire someone who will bring theater/plays back to St. Ann for next year. Our dancers can all perform there. More news to come on this front. 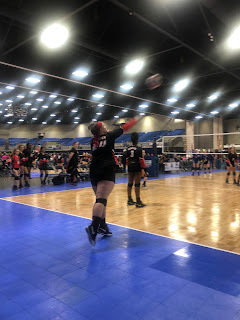 Ansley McLure competed this weekend in the Delta Regional Championship with her club volleyball team, Memphis Metro. 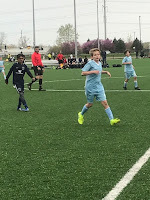 Her team closed out the competitive season with 6 match wins! Ansley was a starting player this year for her team, playing the positions of setter and all around. In this student spotlight, I want to write about the great work of our band. I have asked Mr. John Baum, our band director, to take our band program up a couple of notches. I asked and he has responded with flying colors. Our band has performed and will continue to perform in several band events and competitions. The solo and ensemble band competition took place on Saturday. Below is a list of results for our band students. EXCELLENT (Red Medal): Ian Ladd, Adam Locke, James Kargauer, Sarah Eaton, Vincent Bomprezzi, Rahmad Caster, Luca de Young, Jake Fister, Joyce Galvez, Jan Galvez. We had no student score lower than “GOOD”! Earlier today, both the band and 5th grade choir performed at the Catholic Schools Concert at St. Benedict. Both groups did an excellent job of representing St. Ann. They were outstanding, and I'm extremely proud of our band, choir, Ryan Cooper, and John Baum. Thank you everyone for a job well-done! Lots going on this week as we rapidly approach Easter with 2nd graders preparing for First Communion and the 8th graders preparing for Confirmation. 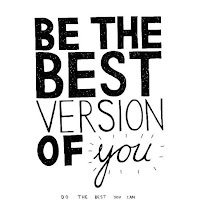 We also have the Iowa Test of Basic Skills and the final easyCBM coming up soon. The 5th and 8th graders will also be taking the ACRE (Assessment of Catholic Religious Education) Test. So, the final Jeopardy answer is "The end of the school year is rapidly approaching and we have much to accomplish." The final Jeopardy questions is "Why do we need your prayers for our teachers and students?" What Joy Do You Bring To Others? Today's blog might be a little shorter than usual. We will see how the writing goes. 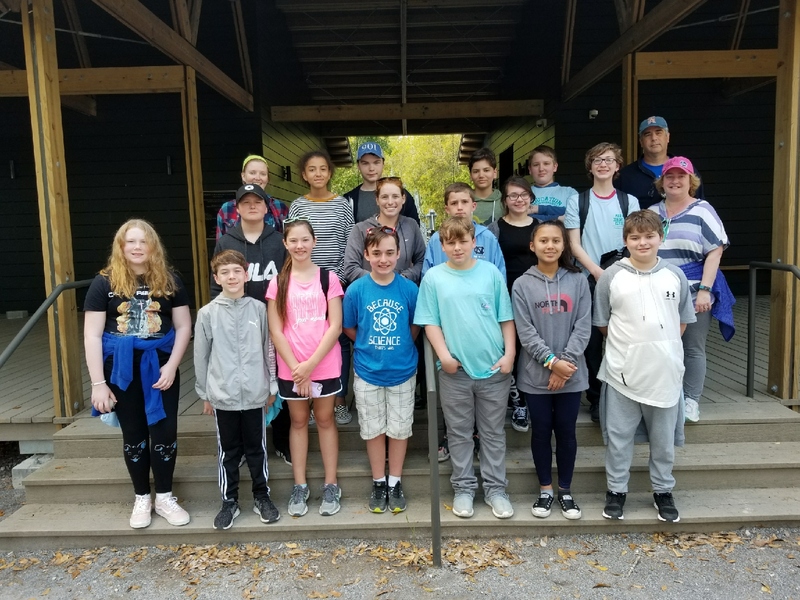 We got back from the 7th grade trip to Ocean Springs, MS late on Friday. I spent much of Saturday just getting caught up, and spent time today working. So, this doesn't leave much time for writing a blog since it is 8:30 pm already and tomorrow will be a long day with the start of the Advanc-ED accreditation process for the Catholic Schools of our diocese. I will need to get to work extra early tomorrow just to organize the day before everybody shows up. At today's 11:30 Mass, Fr. Bill gave us a lesson on the parable of the Prodigal Son. When I was working on my Master's in Catholic Studies, my classmates and I broke down this parable because there are so many lessons to be learned from this one parable. What Father spoke about I had never heard, and I appreciated the lesson he taught us. His underlying question to this parable is what joy do you bring to others? What joy do you bring to others? This question had me thinking about what joy I bring to others because as much joy as people bring into my life, I hope I'm doing the same for others. 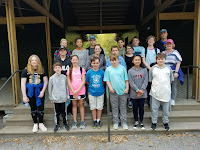 Just this week alone, I was able to spend Tuesday through Friday with many of our 7th graders on our trip to the University of Southern Mississippi Gulf Coast Research Laboratory in Ocean Springs, MS. The students and instructors brought much joy into my life as we learned about the aquatic life of the Mississippi Sound. I didn't even know there is a Mississippi Sound with its brackish waters providing a nursery for the Gulf of Mexico. I'm hoping that adventures such as these for our students will lead to the development of scientists and researchers who will make a positive difference for all of God's creation. People brought much joy to my life on Saturday as well. Got to spend the day with Kelley, my wife, as we attended Mass at St. Michael with Fr. Ben Bradshaw. 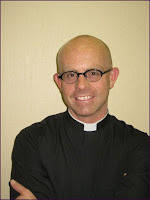 We wish him happiness and success on his trip to Our Lady of Lourdes in France. I asked him to say a special prayer for my mother and my mother-in-law while at Lourdes. What mother wouldn't appreciate prayers for them at Lourdes! Fr. Ben brought joy into my life. 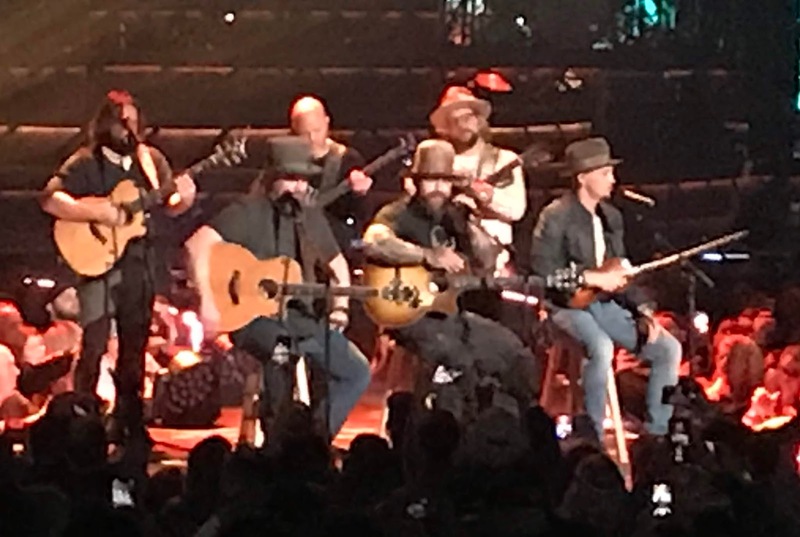 Saturday evening, Kelley and I were treated to the Zac Brown Band concert at FedEx Forum. What an incredible concert. They put on a show like I've never seen before. All the musicians in the band were beyond extremely talented. They have perfected their skills and talents through years of practice and performing. I never imagined musicians as talented as these guys. Hearing their songs on the radio is one thing, but seeing them live is a whole nother world. I hope to one day be as great a school administrator as they are musicians. The Zach Brown Band brought joy into my life. I've been singing their songs all day. Keep Me In Mind. I do bring joy to others, but that is not always the case. Being a lead administrator doesn't mean I'm always the nice guy. When the ship is off course or listing, it is usually up to me to straighten the ship. Most of the time, this can be accomplished by communicating and working together. But some times, I have to make some hard decisions that don't bring joy to others. That's part of being the leader. The funny thing is that once things are straightened out, joy is usually a by-product. What joy do you bringing to others? Are you the type that finds joy first or looks for a reason to complain first? Do people gravitate to you or avoid you? Are your stories happy or sad? 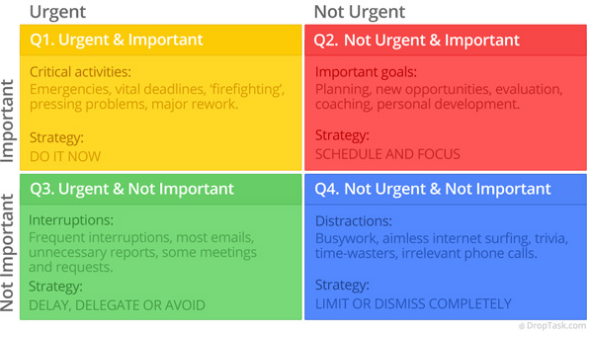 Do you avoid drama or are you the center of drama? Do you find yourself smiling for no reason at all? Do you stand to greet people? Answer for yourself the question posed by Fr. Bill: What joy do you bring to others? If you do bring joy, thank you. You make the world a better place. On March 22nd-23rd, the Rainbow National Dance Competition West Memphis Regionals took place. Cassie Harmon, fifth grader in Ms. Metaxas' class, performed in three dance routines and was honored with multiple high awards, two All Star invites, and an invitation for Dancer of the Year Nationals. 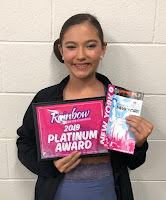 Cassie receive three Double Platinum awards and had the highest score for each of the three routines she and her teammates performed. This was the first time she has ever competed in the intermediate division. She and her teammates placed in the overalls for all 3 of the routines as well. Cassie has earned many more dancing awards that I will feature in future student spotlights. The accreditation process starts tomorrow. Actually, it started back in June. It is just that the Advanc-ED team will be here to finalize the accreditation. Lori Locke and Jimmy Crews will be representing the St. Ann parents at the accreditation meeting. Prayers on the success of this process are much appreciated. In 1963, Gerry and the Pacemakers sang You'll Never Walk Alone. Liverpool F.C. adopted the song title as their club's motto. I'm thinking the Catholic Diocese of Memphis needs to also adopt this motto. Maybe we can expand on it a little to make our motto With God, You'll Never Walk Alone. The Catholic community of our diocese is a pretty tight knit group of people. I've been told that we make up only about 5% of the population in the Memphis area. I would have never guessed that because everywhere I go, I am surrounded by my Catholic brothers and sisters. Even though we make up such a small percentage of the population, we are never far from our Catholic family. In good times and bad, our Catholic community is there together supporting each other. After leaving school last Friday, I drove straight over to Memorial Park for Carla Bray's visitation. I met Carla many years ago through her husband Mark. Mark Bray was one of my mentor teachers at CBHS starting back in 1992. Kathleen, their daughter, is a teacher at Resurrection Catholic School. Carla's visitation was a bit of a CBHS and Resurrection reunion. The line of people there to pay their respects was all the way down the hall almost to the door by the time I left. No, Carla and the Bray Family will never walk alone. The Catholic community was there walking together. On Saturday, we celebrated Mardi Gras in Memphis. It was a crawfish festival at Memphis Catholic celebrating the Jubilee Schools. St. Ann was out there celebrating with the Jubilee Schools. Not only were we out there celebrating with our Jubilee brothers and sisters, we had the biggest turnout of any school. In my short time at St. Ann, I've quickly come to understand to never underestimate what the great folks at St. Ann are capable of getting done. The St. Ann tent had about 36 lbs of crawfish, 10 lbs of grill wings, 5 lbs of Missouri sausage, 10 lbs of pork steaks, Brazilian caipirinha, and 20+ people enjoying a great time. This is not including all the people who came by to sample our food. By the way, we took 2nd place in the gumbo cookoff! Do you think the St. Ann Fall Fest folks will let us grill some wings at the next fall fest? I had leftover wings for dinner tonight. I did something new and different today. We had friends from Missouri in town this weekend to attend Mardi Gras in Memphis together. We decided to go to Mass this morning at the Poor Clare's Monastery with Fr. David Knight. Then we attended Mass at St. Michael with Fr. Ben Bradshaw. After my friends left to return to Jefferson City, MO, Kelley and I attended Mass at St. Ann with Fr. Ernie. Don't think that I have ever attended Mass three times in one day. I thoroughly enjoyed the day and might have to do it more often. I was truly with my Catholic brothers and sisters all weekend. Susan Garts for donating the 20 headphones we requested last week for the computer labs. The headphones are scheduled to arrive this week. Anna Slattery and the students will be very happy. Carol Fister and Thomas Lewis for their gift that enabled us to make the school security camera system a reality. 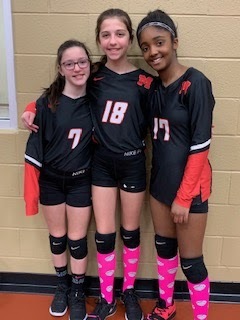 Cadence Orban, Isabella Stuart, and Eriel Wilkins just finished their volleyball tournament in Bowling Green Kentucky. They played in the Vette City Challenge for their Memphis Metro volleyball teams. Way to go girls! Looking forward to watching next year's St. Ann Volleyball Team compete. night of dancing for her solo for the first time this year. She won platinum for her solo and was invited to New York for a dance intensive with the Rockettes. This is a Rockettes dance camp she will be participating in. We are proud of you Grace! Please continue to pray for our students and staff as we continue to grow and move forward. Spring Break '19! Sounds exciting doesn't it. 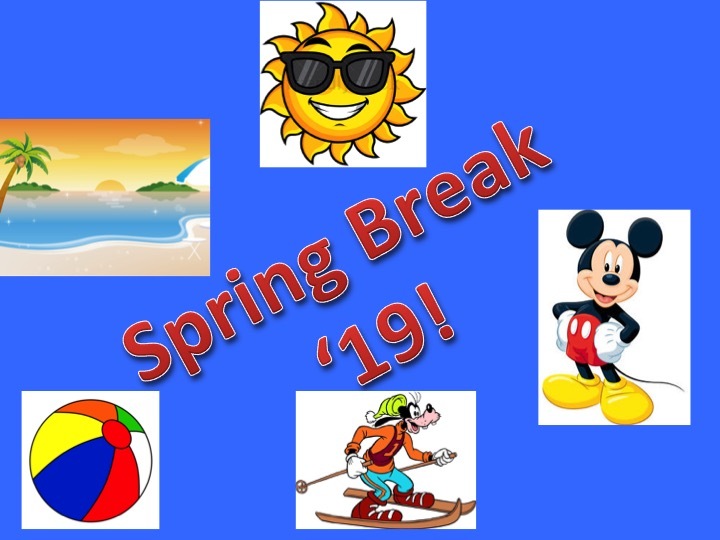 Years ago, Spring Break meant travel, the beach, overseas soccer tournaments (Italy, Mexico, and Brazil), mission trips, spending time with my own children, or just a break from work to relax. 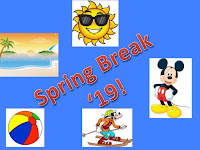 Even though Spring Break '19 sounds exciting, it has now become another work-week at a bit slower pace. No getting to the office by 6:30 am. No carpool lines. No phone calls. And, almost no emails. Yes, I got a lot of work accomplished over Spring Break '19 that I normally would not have accomplished. It is just that I'm the type of person that if I'm going to be at work, I prefer to be there when the classrooms are filled with students and teachers and the office is busy with people coming and going. I think I Neflixed (I just verbed Netflix.) just about every night during Spring Break. I watched a few episodes of Loser and the first season of Cricket Fever. 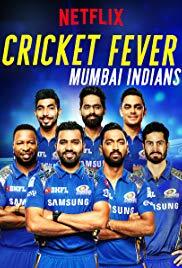 Looking forward to season 2 to see how the Mumbai Indians fair, and cheer them on to hopefully making the tournament. They missed the tournament by one game. I watched several other movies including Pele', Cars 3, Period, End of Sentence, and several documentaries. I did watch at least one Hallmark Christmas movie. I actually planned to take off Friday but ended up working to wrap things up. I did take off Wednesday for no particular reason; just did. I cannot remember what I did. Oh yes, I do remember what I did. I SLEPT! That was nice. I slept. Here's something I did that was pretty cool. I've been waiting for some warm and dry (Dry is the operative word here.) weather so I could finish a project started about a month ago. About half of the fascia and soffit on the back house needed to be replaced. This weekend, I finished repairing the trim, caulked the joints, and painted the repaired sections. It is not often I am able to do home repairs such as this especially due to the lack of time to complete the project and my lack of construction skills. So, I have to brag a little about finishing this home construction project. Speaking of construction projects, a special thanks to Tony Mulrooney and Nathan Harmeier for completing the school security camera project. Nathan Harmeier with Above and Beyond Electric Company installed the wiring from one end of the school to the other. And, if you know the school layout, there are about six different ends to the building. Once the wiring was installed, Tony came in and installed and programmed all the cameras. He still has a little bit of programming to do but the school security camera system is up and running. This was phase one of our school security plan. Now, it is on to phase two, which is installing intercom speakers in the hallways. This week is STREAM Night week. On Thursday, March 21st from 5:30-7:00 pm, we will host our second STREAM Night for this year. It will be an evening of curiosity, exploration, and discovery for all who attend. We will be showcasing work by students from PK 3 through 8th grade. Several organizations throughout the community will also present projects including Pink Palace Museum, St. Agnes Academy, Bartlett Crime Unit, and several more. Come out and join us in the school gym. Arabella Schiavone has been swimming competitively since the age of 7. She swims for Memphis Thunder Aquatic Club in Collierville. Recently, she competed in the 2-day Polar Bear invitational, and participated in six events. Her events included 100 yard Individual Medley, 50 yard Freestyle, 50 yard Breast Stroke, 100 yard Freestyle, 50 yard Butterfly, and 100 yard Backstroke. She ribboned in 4 of her 6 events, and even took 4th place in her 50 Fly and 7th place in her 50 Breast and 100 Back. She continues to shed time off each event every race! Congratulations Arabella! We have so many students involved in bowling that we have our own bowling league. During the St. Ann School Bowling League, Ethan Nichols (5th grader) bowled his highest score ever. This was a scratch game with no handicap. Ethan bowled a 244. Way to go Ethan. Looking forward to you bowling a 300 game. High school bowling coaches might be visiting you soon. Luca de Jong played the roles of Skater Dude and Jock in Disney's High School Musical production at the Bartlett Performing Arts and Conference Center. St. Ann alumni, Penny Rosenberg, played the role of Sharpay. Luca is an athlete, musician, actor, and honor student: think we are seeing the creation of a Renaissance Man. We start the last quarter this week. We need everyone sharp and working hard. There are so many activities scheduled for the last two and a half months of school. This is a time to work harder and not get spring fever. No one on campus needs to coast to the end. This is when all of us need to sprint to the finish. 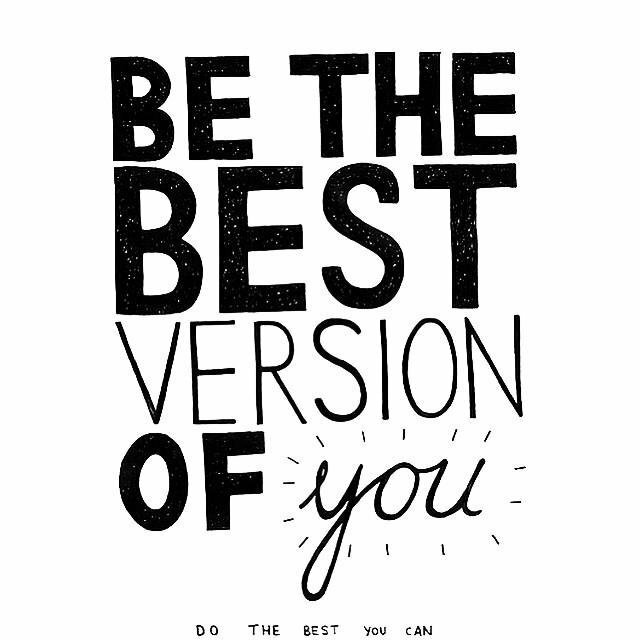 Let's encourage everyone to give their best effort starting with ourselves. One last thing, please keep the students and staff in your prayers. We need the strength of the whole parish to finish strong. One never experiences an uneventful day when working in schools. There is never a regular day where we can set our daily agenda and follow it. My daily agenda changes starting at 8:05 am. That's the time we usually finish the daily prayers and morning announcements. 9 out of 10 days somebody is waiting for me to discuss something, and you know that something is usually not about what a great job I'm doing. Just an FYI, I do enjoy putting out fires most of the time, and I don't mind dealing with unpleasant situations. I don't look forward to dealing with the unpleasant. It is just that I've been doing this for so long I know that it is a part of the job. And unfortunately, not everyone agrees with my methods or decisions of how I deal with the unpleasant or putting out fires. Not every day nor decision is rosy, but I do wear rose-colored glasses. So, I have that going for me. Since last fall, we have been planning the Alumni Fat Tuesday Party. We had about 60 alumni RSVP and we were excited for such a great turnout. Our decorating committee, mainly made up of St. Ann alum, did a great job of decorating the gym. The Knights of Columbus stepped up as usual and took care of the food. Special thanks to Jack and Stacey Griffith for leading the charge getting the food ready. In the end, about 40 people attended the party. I am not a St. Ann graduate, but I had a great time, and do look forward to the next St. Ann alumni get-together. Parents and Students! Time for Colt Star Award nominations. The Colt Star Award recognizes faculty and staff members at St. Ann who exhibit leadership, participate in school and community projects, and foster good citizenship and high academic achievement at St. Ann. CLICK HERE to download the Colt Star Award nomination form. On Saturday, March 23rd, St. Ann will have a tent at the Jubilee Schools' Mardi Gras In Memphis Crawfish Boil and ETW 5K. We have a Memphis Catholic intern working at St. Ann every day. In return for their support, we are going to support the Crawfish Boil and 5K. Several of our St. Ann friends and alumni are also Memphis Catholic Chargers. I am inviting all St. Ann folks to come out for a day of fun at Memphis Catholic. Bring your chairs and join us at the St. Ann tent. Admission is $5 with children 5 and under free. There will be live music, bouncy castles, face painting, and corn hole games included with admission. There will be food and drink available for purchase. A box of crawfish will be available for $10. My wing cooking friend from Jefferson City, Philip Schulte, will be grilling his "Soon to be World Famous Wings" and Mid-Missouri homemade sausage. We had a good St. Ann crowd at the Wings of Jubilee last fall. Let's have a great turnout for the Crawfish Boil and 5K. The school security camera system is almost complete. When everyone returns from Spring Break, they will see our cameras covering every hallway, cafeteria, and gym. We are already working on installing speakers in the hallway. The final step will be the door locks. I might have to take a locksmithing class to get this done, but we need to replace the door locks throughout the campus. Lastly for this week, the computer labs are being used more this year than ever before. Many of the computer programs such as IXL, ReadWorks, easyCBM, and Spelling Words used by the students require headphones. Many of the head phones we currently use need replacing. Amazon is running a special on the Califone headphones we use. 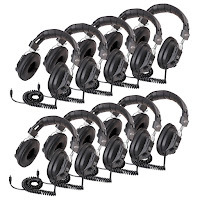 We can purchase a set of 10 Califone headphones for $94.26. We are in need of two of these sets. Purchasing the headphones individually is roughly $13 a piece. If you can help purchase two sets of 10 Califone headphones for our students, we greatly appreciate your help. working on summer camps. Hopefully, the fires will be few but know there will always be fires.